The city police have been able to crack the murder case of Satish Dhondiba Rawool (36) an auto rikshaw driver by group of unidentified persons on October 1 near Foundry cluster Udyambag. 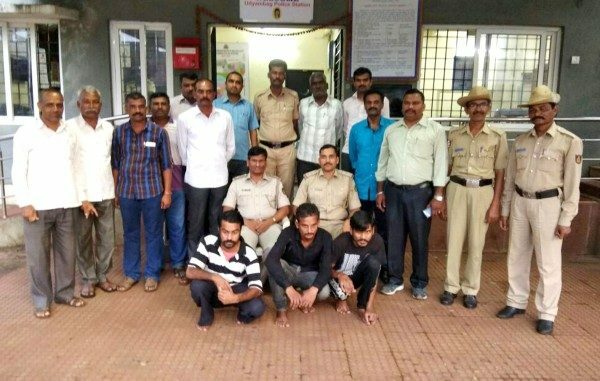 Police have arrested accused Chetan alias Mauli Sambhaji Pote of Joshi Galli, Shahapur, Vijay alias Maya Ganpat Ghatkar of Joshi Galli and Parashuram alias Pintu Manohar Jadhav of Patil Galli, Vadgaon. The main intention of the crime according the police was to rob Rawool but as he clashed the group killed him. The group knew that Rawool had good amount of cash and hence boozed and called him near Foundry cluster in the afternoon of Oct 1 and planned to rob him of his cash. But their plan failed as Rawool fought back hard and in the clash hid head was smashed to a huge rock nearby. Then it is alleged that they smashed his head again and again on the stone as all of them were in a intoxicated state. Later, they took his money and all belongings, before disappearing from the scene. A special team was formed headed by Assistant Commissioner of Police C T Jayakumar, Udyambag Inspector Niranjan Patil, Camp Inspector Sudarshan Pattankudi, Arun Kamble, Sunil S, Shivaji H who cracked this case.